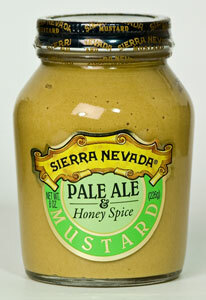 Fans of Sierra Nevada and fans of mustard, rejoice! Here are the three Sierra Nevada Mustards (Pale Ale & Honey Spice, Porter & Spicy Brown, and the 2007 Grand Champion - Stout & Stoneground). Net weight of each jar is 8 oz for a whopping pound and a half of great beer mustard all packed in a Mustard Museum gift box. A great spicy brown sandwich mustard. Also try on any sausage .Made with award winning Sierra Nevada Porter Beer. Ingredients : Distilled Vinegar, Water, Mustard Seed, Salt, Porter, Cane Sugar, Spices, Turmeric. 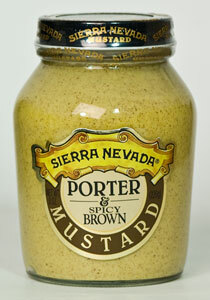 Grand Champion Award at the 2007 World-Wide Mustard Competition; Bronze Medal 2008. Robust and vibrant. Made with Sierre Nevada's award winning beer. 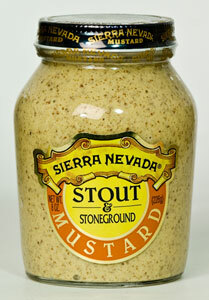 A wonderful stone ground mustard great on anything from sausage to baked potatoes. Ingredients : Distilled Vinegar, Water, Mustard Seed, Salt, Stout, Spices. Ingredients: Distilled Vinegar, Water, Mustard Seed, Honey, Cane Sugar, Salt, Pale Ale, Spices, Turmeric.